I am Larry D. Sweazy. I write the Josiah Wolfe, Texas Ranger series (Berkley). 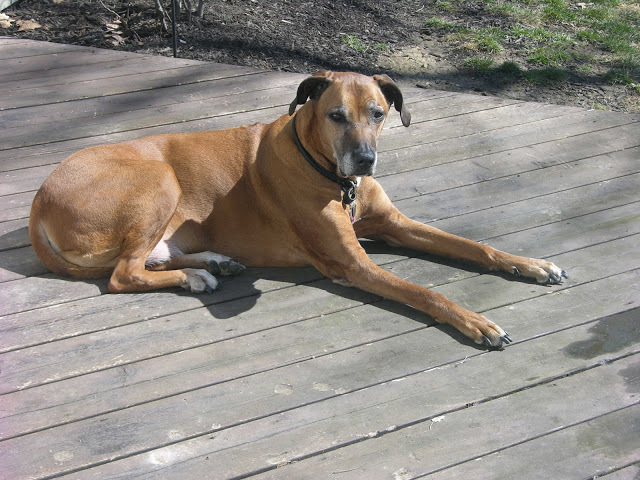 My dogs are Brodi, 11 [photo below left] and Sunny, 6 [with me, photo right] -- both are Rhodesian ridgebacks. The dogs join me my office every morning for that first cup of coffee, and for that second and third cup, too. Brodi is now 11 years old -- has he slowed down much? For a 100 pound dog, Brodi's doing pretty well for his age. We still walk twice a day, though a little slower than we once did. He has some health issues, a little arthritis and megaesophagus, a breed defect, which we manage with how we feed him. Brodi has always been a watcher instead of a chaser, so being active has always been a challenge for him. Sunny is the athlete, the chaser. 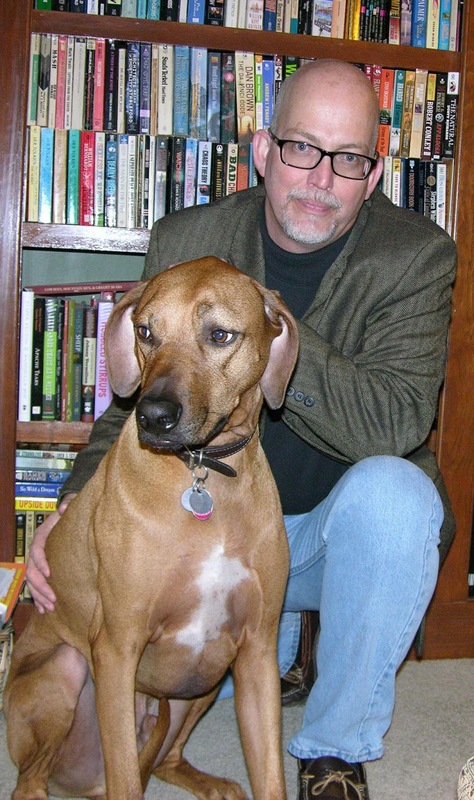 Are there any dogs in your new novel, The Gila Wars? There's not. That's something I realized at the end of writing that book. Josiah Wolfe is never home, and as a Texas Ranger, he's always on the trail going from one end of the state to the next, so it would be difficult for him to own a dog. Maybe the next series, but that might prove to be difficult, too. I do have an idea for a series about a boy and his dog, maybe I'll get to that one of these days. I can't think of a way they hinder my writing at all. The walks help get me outside, away from my desk, and keep me in shape (mostly) as much as it does them. Their presence is a great comfort. One, or both, are usually not far away from me. I think they make me a better human being, so hopefully, that helps me be a better writer. If Brodi and Sunny could change one thing about Texans, what would it be? I'm not sure how to answer that question. They've never met a Texan they didn't like. If Hollywood made a movie about your life in which your dogs--and your cat--could speak, which actors should do their voices? Nigel will be so glad to be included in this. Actually, I'm positive Nigel has a British accent. I think he might be the Black Adder (Rowan Atkinson). Brodi would most definitely have Sam Elliot's voice, badass and comforting at the same time. Since Sunny's full name is Audie Murphy See You At Sundown, he'd sound like the war hero and actor he's named after, Audie Murphy. Maybe...what's the worst thing you ever smelled? The problem is one question wouldn't be enough, would it? Visit Larry D. Sweazy's website and blog. Learn more about The Gila Wars, the latest novel in the Josiah Wolfe, Texas Ranger series. Coffee with a Canine: Larry D. Sweazy and Brodi and Sunny (April 2011). Great interview and Larry sounds like a great pup dad! Great interview. We agree walking the dogs and getting out and about is great for the writing. Have a marvelous Monday.